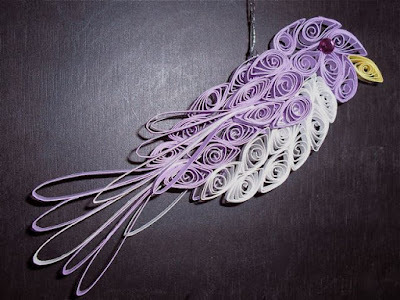 Paper quilling (or filigree) is a very old craft technique. It involves curling narrow strips of paper into coils, re-shaping the coils, and gluing them together to create a finished product. I’ve seen lovely cards made with just a simple quilling embellishment and elaborate pieces that are literally works of art. For Christmas I opted for this cardinal to keep the tradition of adding a new bird to our tree each year. According to my grandmother, that brings good luck. I sure hope so! As quilling is one of those crafts that disappear and later come back to intrigue a new audience, stores don’t always keep up with supplies. If your craft store does not carry quilling items, a quick search online will give you a lot of sites that have supplies and technique instructions (not to worry, it’s a very easy technique). Many gadgets are available but believe it or not, all you need to get started are paper strips, a simple curling tool, and white glue. Most sites have an extensive array of papers, tools, kits, and books. Be sure to look through the photos on sites that have a gallery. You’ll be certain to find things you want to make. 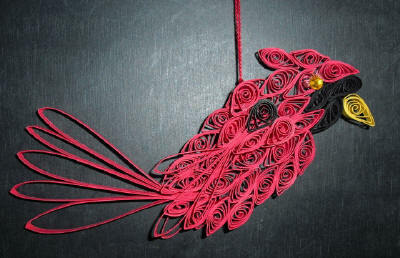 Paper strips: 1/8“ wide and 5+1/2” long for coiled pieces (red + black for bird body; harvest gold/yellow for beak). Five pieces of 1/8” X 5+1/2” for tail feathers, six pieces of 1/8” X 3” and two pieces of 1/8” X 4” for feathers for two wings. For this project, I wanted a rich red color and paper with more heft than regular quilling paper so I cut my own out of cardstock, using a paper cutter. However, regular pre-cut quilling paper will work just fine. Quilling tool: basically a handle with a thick needle, around which you coil the paper. Because cardstock is heavier than regular quilling paper and doesn’t curl easily around the needle, I used the slotted tool which is a popular alternative to the standard one. As the name implies, it has a slot to hold the paper as you coil it and the curling process goes very quickly with it. The tools are a staple on every web site selling quilling supplies. Rhinestones: (flat back, self-adhesive) for eyes. Find them in the scrapbook embellishment aisle. White glue: I have a fine tipped glue bottle but many quillers just put a puddle of glue on waxed paper and use a toothpick for an applicator. Pattern: I cut a picture of a cardinal out of a nature magazine, scanned it into my computer, adjusted the size to what I wanted, and printed it out for a pattern. Cutting the paper myself took the most time. I coiled pieces while watching my favorite TV shows so that went very quickly and before I knew it, I had enough for a whole flock of cardinals. Slip the bird picture under the plastic sheeting on the corkboard to use it for a pattern guide. I formed the tail feathers by gluing the ends of the 5+1/2” strips together to form loops, then glued the loop ends together to create one unit. I glued the feather unit to the base of the body between two marquise shapes. The straight pins are useful for holding it all in place on the corkboard until the glue dries. The plastic sheeting prevents the glue from seeping through and gluing your project to your work surface. The wings were formed using both marquise and tear-drop shapes and the wing feathers were formed from three 3” strips and one 4” strip. I glued them together in the same way as the tail feathers. Glue a wing on each side of the bird and attach a rhinestone on each side for eyes. Finally, loop the heavy thread through a coiled piece just below the bird’s head for a hanger. With Christmas ornaments put away for now, I’m exploring other colors and types of birds to use in mobiles or window hangings or a little gift for a bird-loving friend. Since the basic materials in quilling are paper and glue, I thought it very cost-effective and in keeping with BetterBudgeting principles! Here's another one I made, it turned out lovely! Copyright © 2012 by BetterBudgeting. All rights reserved.